Vehicles like the versatile Chevy Traverse effortlessly blend utility and style. If you want a sedan, hatchback, wagon, or minivan, you're in a shrinking group of car buyers. The SUV and crossover segments steal the spotlight once again at the 2019 Chicago Auto Show with updated models in every shape, size and price range. From everyday compact crossovers for city driving to the most off-road capable, rugged vehicles, these are the 15 best crossovers and SUVs from this year's Chicago show. The Acura MDX was an excellent 3-row SUV before, but with several updates for 2019, it's now at the top of its game. Available with either a 3.5-liter V6 for 290 horsepower or a 3.0-liter hybrid V6 for 321 horsepower, the luxury crossover gets upgraded with a new A-Spec package and active damper system. Thanks to the A-Spec package, the MDX looks edgier with a new fascia, side skirts, carbon fiber trim, and new 20-inch gray alloy wheels. Cadillac's new entry-level crossover might be accessibly priced, but it's anything but barebones. The 2019 XT4 is a compact crossover with a fuel efficient 2.0-liter 4-cylinder engine with Active Fuel Management which gives 237 horses and 258 lb-ft of torque. Cadillac hopes to woo younger buyers by marrying affordability and style. The XT4 also offers the roomiest second row in the segment with 39.5 inches and 40.4 inches of front legroom. 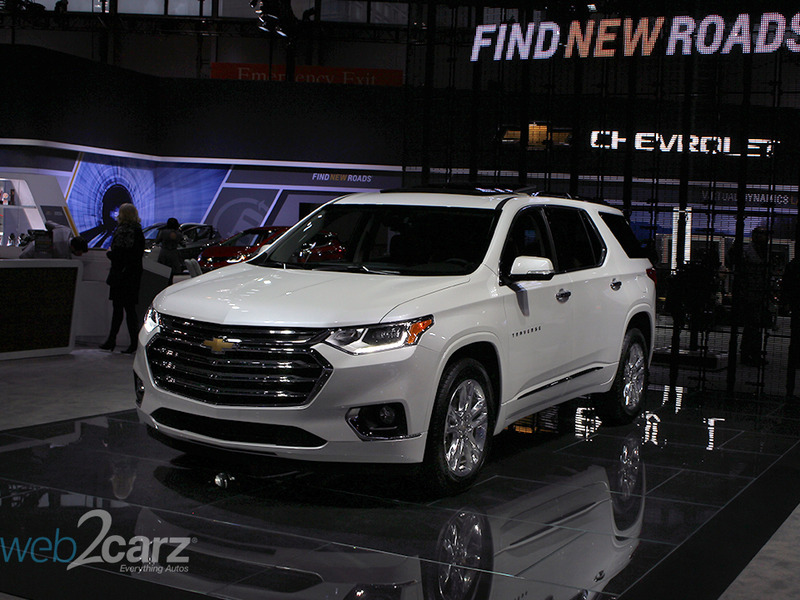 The 3-row 2019 Chevrolet Traverse gets a new LT Premium package for 2019 which is standard on the RS trim and available on the LT leather trim. It adds satellite navigation software, a Bose 10-speaker premium audio system, a rear camera mirror, and a 360-degree Surround Vision system. The Traverse can be had with either a 3.6-liter V6 for 310 horsepower or a 2.0 liter turbocharged 4-cylinder for 257 horsepower. It is a comfortable family hauler with enough space in all three rows to fit both children or full sized adults. Combining the performance of a sports car with the practicality of an SUV, the Dodge Durango still manages to sell well despite rumors of its demise. The 2019 Durango looks great with new exterior colors and wheel designs. New safety and performance features include a standalone blind-sport monitoring system and a trailer tow package for all trims. Three available engine options include a 3.6-liter V6 for 293 horsepower (295 with available dual exhaust), a 5.7-liter V8 for 360 horsepower, and a 6.4-liter V8 that for 475 horsepower in the SRT trim. The 2019 Ford Edge gets updated for style and safety including a refreshed exterior and standard active safety features. The new Edge gets LED headlights, a rotary gear shifter, automatic braking, lane-keeping system, automatic high beams, lane centering, and Waze navigation. Most newsworthy is a new ST trim which is a first for Ford in the performance SUV segment. Engine options include a 2.0-liter turbocharged 4-cylinder that makes 250 horsepower and a 2.7-liter turbocharged V6 that produces 335 horsepower in the ST trim. Ford brought the current 2019 Ford Explorer to Chicago but all the buzz was centered around the all-new 2020 Explorer debut. The biggest change is a shift from front-wheel-drive to rear-wheel-drive for sportier performance and improved towing capacity. Engine options include a 2.3-liter turbocharged 4-cylinder that produces 300 horsepower, a 3.0-liter turbocharged V6 that produces 365 horsepower, a 3.0-liter turbocharged V6 that produces 400 horsepower (ST), and a 3.3-liter V6 that produces 318 horsepower in the hybrid. With a refresh imminent for 2020, the 2019 CR-V remains nearly unchanged. Luckily, not many changes are needed. The CR-V is a top-selling compact SUVs thanks to its spacious cabin, excellent driving and safety features, and fuel efficiency. Powertrain options include a 2.4-liter 4-cylinder for 184 horsepower and a 1.5-liter turbocharged 4-cylinder for 190 horsepower. EPA-estimated fuel economy ranges from 25 mpg city to 34 mpg highway. The subcompact Kona crossover has taken the segment by storm since its launch. With the addition of an electric model for 2019, it shows no sign of slowing down. The sporty and firm suspension, as well as unique styling inside and out, make the Kona a standout crossover in the segment. Engine options include a 2.0 liter 4-cylinder that makes 147 horsepower and a 1.6-liter turbocharged four-cylinder for 175 horsepower. The new electric model has a 150kW motor for 201 horsepower and a range of 258 miles. The Jeep Wrangler has always been a leader in off-road capability and with its refined on-road performance, the 2019 Jeep Wrangler is becoming a top contender in the SUV segment overall. For 2019, Jeep adds adaptive cruise control, forward collision warning, and additional exterior color choices. Wrangler buyers can choose from a two or four-door version and Sport, Sport S, Sahara, and Rubicon trims with Rubicon offering the most off-road prowess. Engine options include a new 2.0-liter turbocharged 4-cylinder engine for 270 horsepower, a 3.6-liter V6 for 285 horsepower, and a 3.0-liter V6 diesel producing 260 horsepower. The 2019 Land Rover Range Rover Velar was not updated for 2019, but the luxury 5-seater carries over plenty of excellent features from the last model year. The Range Rover Velar's styling is hard to match with its simple and sleek exterior and upscale interior materials. The Velar is also very capable off-road with its permanent all-wheel-drive system standard. Available engines include a 2.0-liter turbocharged 4-cylinder offering 247 horsepower, a 2.0-liter turbocharged 4-cylinder diesel for 180 horsepower, and a supercharged 3.0-liter V6 for 380 horsepower. After scrapping the MKX, Lincoln replaced it with the new midsize 2019 Nautilus. The Nautilus is based on the Ford Edge and offers two engine options including a 2.0-liter turbocharged four-cylinder for 245 horsepower and a 2.7-liter turbocharged V6 for 335 horsepower. All-wheel-drive is the only option for the V6 while the four-cylinder can be had with All-Wheel-Drive or Front-Wheel-Drive. The Nautilus offers a great portfolio of safety features like automated emergency braking with pedestrian detection, blind-spot monitor, active parking assist, and lane-departure warning. The 2019 Navigator offers luxury in a larger package than it's Nautilus sibling with seating for 7. For 2019, the Navigator is updated with safety features such as automatic emergency braking, pedestrian detection, blind-spot monitors active lane, and control adaptive cruise control. All Navigator trims have a 3.5-liter twin-turbocharged V6 for 450 horsepower. Several key improvements make the Mazda CX-5 one of the best values on the market in the compact crossover segment. For 2019, a more powerful 2.5-liter turbocharged 4-cylinder gives the higher trims a power bump from 185 horses to a maximum of 250. The lower trims get a 2.5-liter 4-cylinder that produces 187 horsepower. In addition to a bump in power, the CX-5 gets improved suspension and steering. A new, top-tier Signature trim rounds out the upgrades for 2019. This mid-size, body-on-frame SUV may not be as loaded with the latest features as some of its competitors, but it will impress off-road. While the Toyota 4Runner goes another year without a full redesign, Toyota adds a Nightshade Special Edition trim for 2019 that gets you a stylish package of dark accents inside and out. Only one engine is available for the 4Runner which is 4.0-liter V6 that makes 270 horsepower and both Rear-Wheel-Drive or 4x4 are available. The Volkswagen Atlas comfortably fits either 5 or 8 passengers and the third row is not shortchanged as with many 3-row SUVs. Despite its massive stance, the 2019 Atlas is easy to drive thanks to excellent shock absorption and precise steering and handling. There are two engine options including a 2.0-liter turbocharged 4-cylinder offering 235 horsepower and a 3.6-liter V6 with 276 horsepower. Updates for 2019 make this family vehicle safer thanks to the addition of front assist, blind spot monitor and rear traffic alert standard on all trims.